In what has become a rite of summer in New York, the Potomac Theatre Project (PTP) has taken up residence at the Atlantic Stage 2. The company’s first offering is a double bill featuring Howard Barker’s The Possibilities, directed by Richard Ramagnoli, and Caryl Churchill’s The After-Dinner Joke, directed by Cheryl Faraone. Although stylistically quite different, the plays generally fit together well in their emotionally dizzying and intellectually disorienting exploration of power and politics. Tara Giordano (left) is Selby, the benevolent crusader, and Christopher Marshall (right) is a penny-pinching and snake-loving mayor in The After-Dinner Joke. 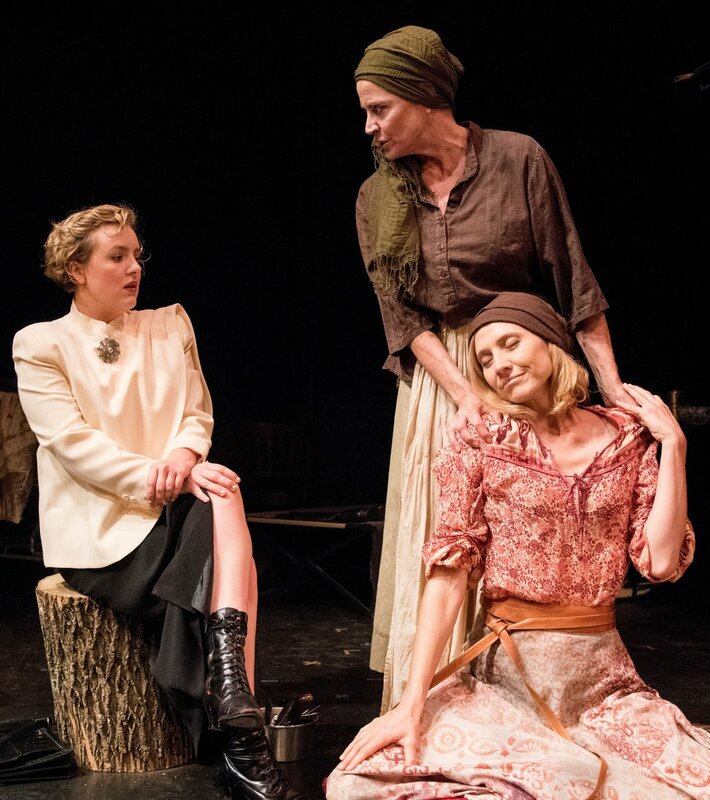 Top, from left: Eliza Renner is a well-meaning but imprudent Israeli representative, Marianne Tatum is Judith’s doting servant, and Kathleen Wise is the murderous Judith in The Possibilities. Barker coined the term “Theatre of Catastrophe” to describe his work. In his plays, politics, eroticism and passion collide, while he simultaneously assaults the audience’s senses through the juxtaposition of humor and extreme violence. These characteristics are evident in the first play on the double bill, The Possibilities, which includes four short playlets (of the 10 from Barker’s full cycle). Each one presents abuses of power, and three of them look at the issue through the lens of gender and sexuality. The curtain-raiser, The Unforeseen Consequences of a Patriotic Act, presents the aftermath of the biblical heroine Judith (Kathleen Wise), who severed the head of Holofernes and consequently delivered the Israelites from the oppression of the Assyrians. Judith, as presented here (and not entirely convincingly), is not a selfless heroine as she is generally depicted, and in modern parlance, she has some real anger issues. Next, Reasons for the Fall of Emperors features a rattled and cowering Czar Alexander of Russia (Jonathan Tindle). Paradoxically, only when he is reduced to emotional and physical nakedness can Alexander exert his power and ruthlessness. She Sees the Argument But offers a squirm-inducing rejoinder to the #MeToo movement in which female attractiveness is used both as a weapon and source of humiliation. The most successful of the four is Only Some Can Take the Strain, which is a cross between Bertolt Brecht’s Mother Courage and Ray Bradbury’s Fahrenheit 451. In the playlet an old woman bookseller (Marianne Tatum) pushes a shopping cart full of state-ordered banned books. She is reluctant to part with any of her stash in case the knowledge they contain falls into the wrong hands. When confronted by a young rebel (Adam Milano), who desperately desires a forbidden text, the bookseller must choose between self-preservation and political resistance. Giordano with Adama Milano, an airplane passenger who sees potential hijackers everywhere in The After-Dinner Joke. The second play on the double bill is Churchill’s The After-Dinner Joke, a teleplay that originally appeared on the BBC in 1977. The play is composed of 66 scenes, many of which are fragmentary and sketch-like in their integration of gags and broad humor. In fact, the title ironically refers to the frothy, seeming insignificance of the play, which ultimately deals with a very serious subject. As an example of early Churchill, The After-Dinner Joke highlights the playwright’s commitment to politics, class issues and absurdism. The main character is a young corporate secretary named Selby (Tara Giordano), who is socially minded, kindhearted and incredibly naïve. She informs her boss Mr. Price (Jonathan Tindle) that she intends to quit working for the company and start a charity. Mr. Price is so impressed with her initiative that he agrees to keep her on the payroll since charitable foundations are, after all, integral to capitalism. Capitalism and politics keep infringing on Selby’s altruistic endeavors, and she valiantly tries to keep them at bay. She explains, “A charity by definition is nonpolitical. Politics is by definition uncharitable.” Yet as she encounters a bevy of rock stars, government officials, and guerrilla fighters, Selby experiences how interrelated politics and philanthropy actually are. Structurally and aesthetically the play closely resembles Monty Python’s brand of surrealist comedy. Even the accompanying animated projections, with incongruous images of cows, lemon meringue pies, and a bank robber darting in and out of windows seem to be influenced by the Flying Circus series. The play has its share of laughs and is interesting as a glimpse of a rarely produced Churchill work, but it is not nearly as silly and ridiculous as one would hope. The cast is game and valiantly navigates the supreme Britishness of the characters and humor, but unfortunately, the production does not rise to the level of Pythonesque lunacy. Marshall, a comforting peasant, with Jonathan Tindle as the anxious Czar Alexander in The Possibilities. Photographs by Stan Barouh. The plays are presented simply, with minimal set pieces and modest but evocative costumes. The focus, therefore, is placed on the plays and their ideas. 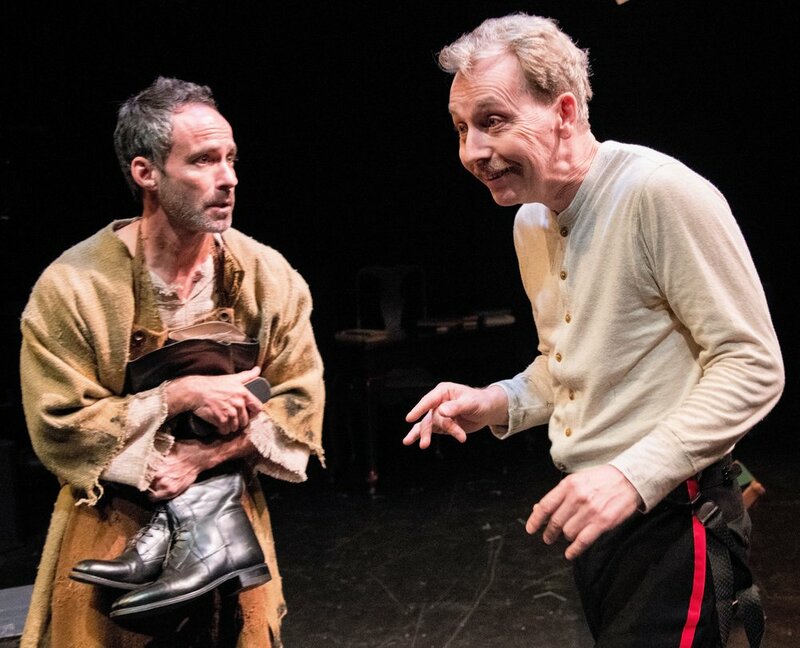 While the results of the Barker-Churchill double bill are nevertheless a mixed bag, the Potomac Theatre Project is to be commended for showcasing the little-known work of these two luminaries of the British theater. The double bill of Howard Barker’s The Possibilities and Caryl Churchill’s The After-Dinner Joke plays through Aug. 5 at the Atlantic Stage 2 (330 West 16th St. between 8th and 9th Avenues). Evening performances are at 7 p.m. Tuesdays through Sunday; matinees are at 2 p.m. Saturdays and Sundays, with select Wednesday and Thursday matinees at 2 p.m. as well. Tickets are $37.50, $22.50 for students and seniors. For more information, call (866) 811-4111 or visit PTPNYC.org.